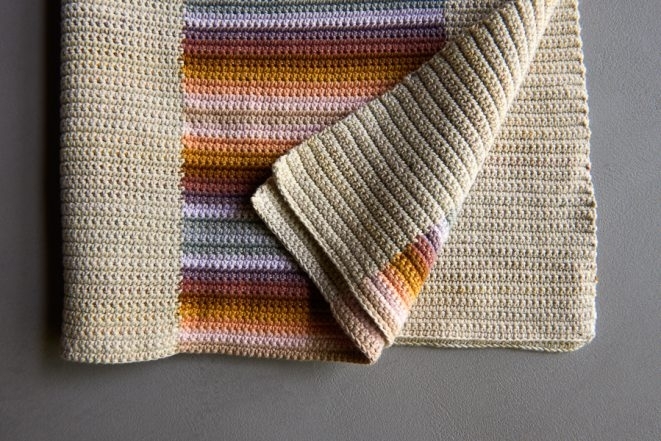 As the building block of fancier stitches, there’s still nothing quite as pretty as an expanse of single crochet. 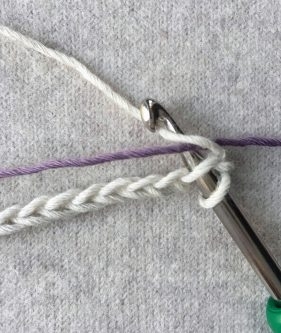 So, how fun when we reimagine this simple stitch in a new yarn that we love and a color combination that uplifts us, all while creating something beautiful and easy! 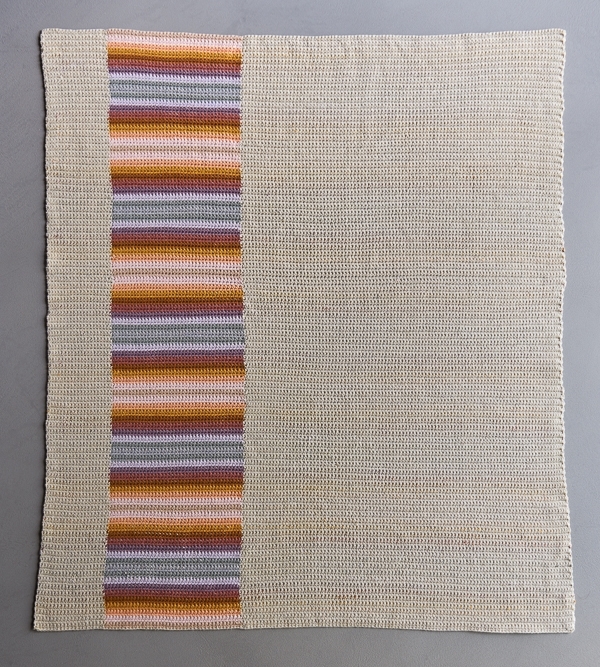 Our Stacked Coins Blanket borrows a tried-and-true motif from the world of quilting and takes the opportunity to dip into Cotton Pure’s palette of over 40 stunning colors. We chose ten that flicker from foggy morning to glowing sunset, all against a natural background of Birch Bark. 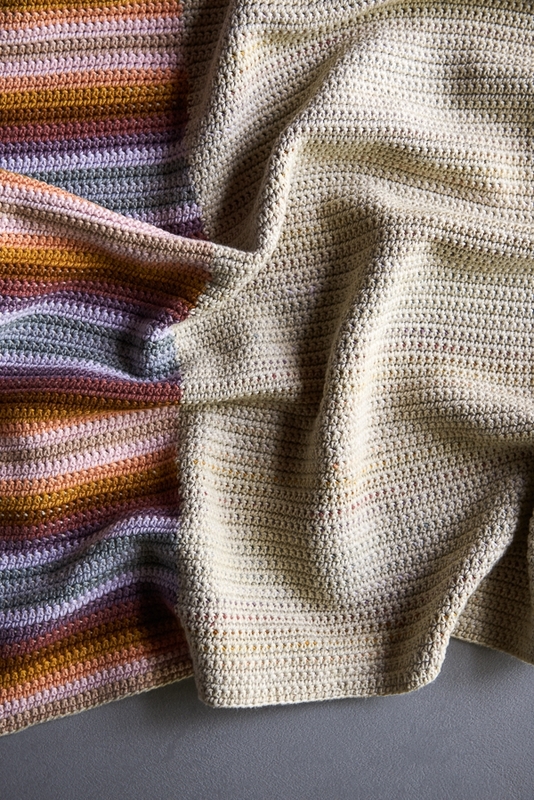 Get all these gorgeous colors together with our Stacked Coins Blanket Bundle! 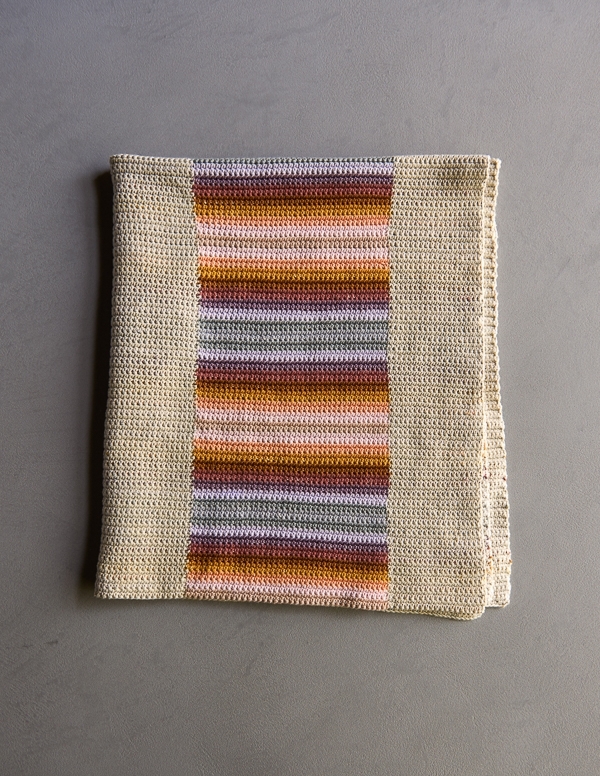 A color adventure and a small technical challenge, our Stacked Coins Blanket embraces the ease of single crochet while adding the extra excitement of working with two strands of yarn at the same time. 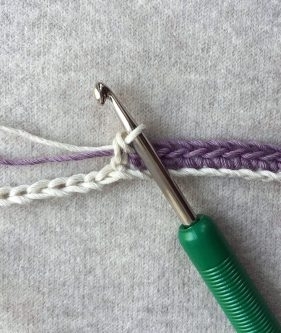 I had never tried this colorwork technique, but it’s incredibly easy, and for those who have never done it, we provide step-by-step instructions below. With Color A, chain 166. Note: For the sake of color contrast and clarity, in these photos we use Purple Heath as Color B instead of Teacake Pink. Begin Row 1 (right side): Place Color B behind the chain, with its tail to the right and its working yarn running left along the chain. 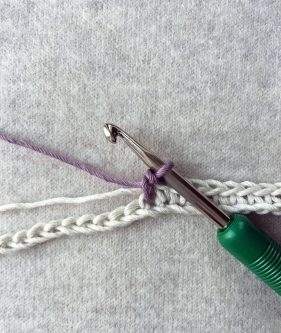 Then, starting with the second chain from the hook, use Color A to make 1 single crochet into the next 104 chain stitches, placing the hook under Color B as you begin each stitch. 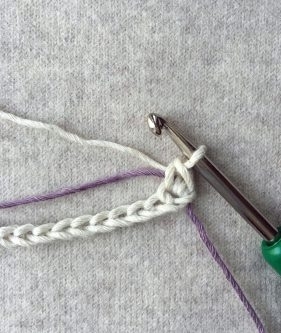 Keep the tension of Color B relaxed as it gets encased in Color A’s stitches. 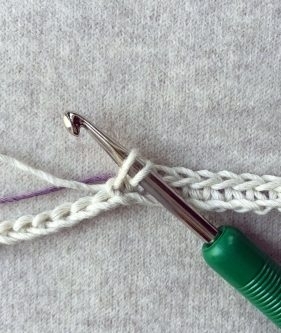 Continue Row 1: Insert the hook into the next chain stitch, and without first going under Color B, pull up a loop of Color A. 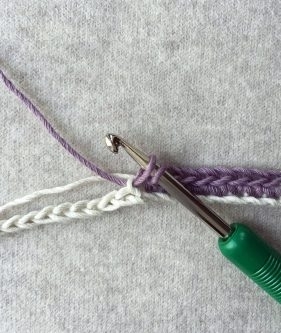 Then, finish the single crochet by pulling a loop of Color B through the two loops of Color A. Now with Color B, work 39 single crochets, placing the hook under Color A as you begin each stitch. Finish Row 1: Change colors as before (pull a loop of Color A through two loops of Color B) so that you are now using Color A and encasing Color B. 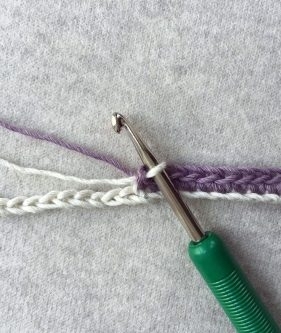 Make 1 single crochet in each chain to end of row. Turn. 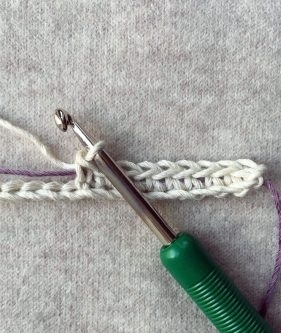 Row 2 (wrong side): Starting with the first stitch from hook, use Color A to make 1 single crochet into the next 19 stitches, placing the hook under Color B before each stitch. 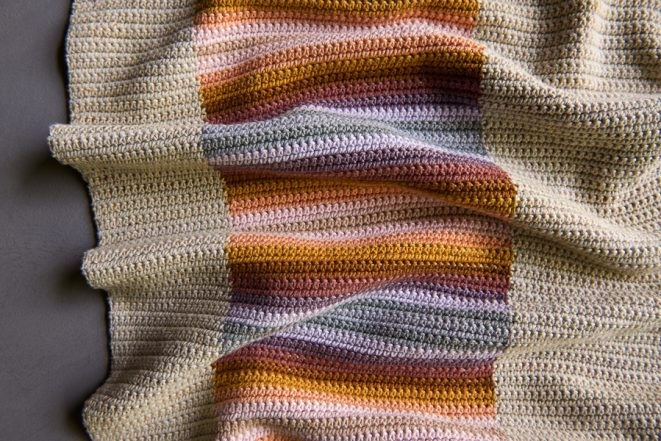 Change colors as before, so that you use Color B, encasing Color A, to work 39 single crochets. Then change colors, and use Color A, encasing Color B, to make 1 single crochet in each stitch to end of row. Cut Color B, leaving a 4-inch tail. Turn. *Color C, Color D, Color E, Color F, Color G, Color H, Color I, Color J, Color K, Color J, Color I, Color H, Color G, Color F, Color E, Color D, Color C, Color B, repeat from * 4 more times. Weave in ends and block as desired. Note: We found it best to machine wash the blanket in cold water on a gentle cycle and to let it air dry. Que trabalho harmonioso, em suas cores. Parabéns. Assim tenho vontade de fazer crochet. Any chance this could be turned into a knitting pattern? Although we don’t currently have a knitted version of the pattern available, it’s certainly something we will consider in the future. Thanks for your interest in the pattern and for writing in! 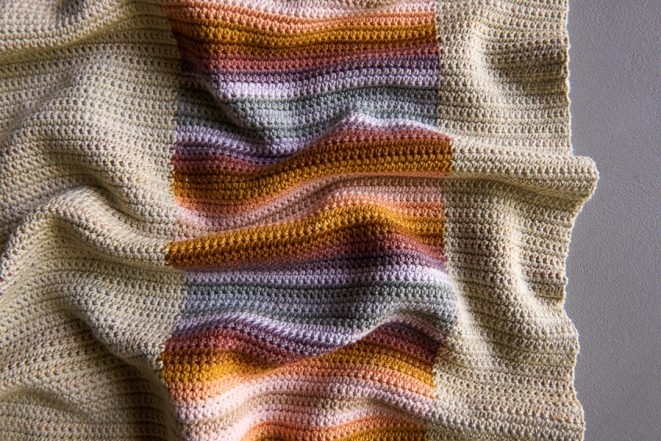 Is there a knitting pattern available for this blanket? Thanks for the question. Unfortunately we don’t have a knitting pattern for this pattern at the moment but we will keep your request in mind for the future! Because the colors are all encased in the neutral Birch Bark, and hints of color show though slightly throughout, weaving in the ends actually blends in well. 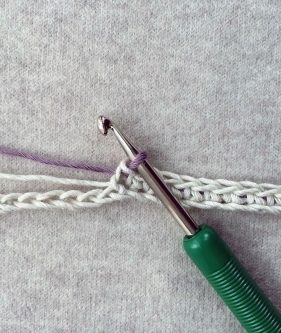 You can weave the ends in within the base of the single crochet stitches on the rows in which they occur and it should look quite unobtrusive, smooth and secure. I hope that this helps answer your question — please let us know if you have any further concerns and thanks for writing in! Best of luck with the blanket! I would love to see this in a knitted pattern as well. This is beautiful! 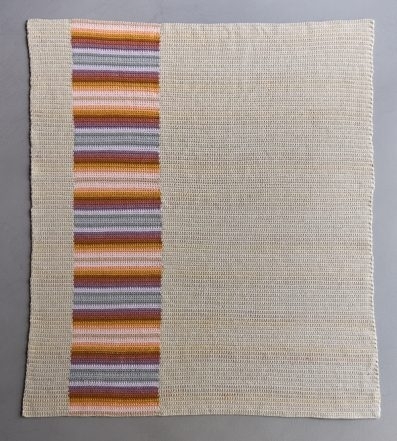 I am interested in making a larger version of this blanket (both wider and longer). How would you suggest I adjust the pattern? Thank you! Thanks for writing! The blanket size would be easy to adjust! What do you think you would want your final measurements to be? Thanks for your question. I suggest casting on about 80 more stitches to get to 50″ wide. As for the length, that depends on how much yarn you buy. I believe you’ll need double the amount of yarn for the color stripes and triple the amount for the background yarn. You might be left with some skeins left over because my estimate might not be spot on, but as long as you don’t wind them they are exchangeable for store credit. Hope this helps! Hi! Thank you so much for this beautiful pattern! I’ve completed Row 1, and I’m having a hard time figuring out how to get the proper color to show on the right side when working Row 2. Would it be possible to see pictures (or a video would be even better) of how to work Row 2? I’m not having success with the instructions as written. Thank you so much! Love this pattern but am having a heck of a time figuring out how to carry the ‘B’ color on row 2. Help!! I’m on vacation and wanting to work on this! 😉 is it possible to show pics of row 2, also? 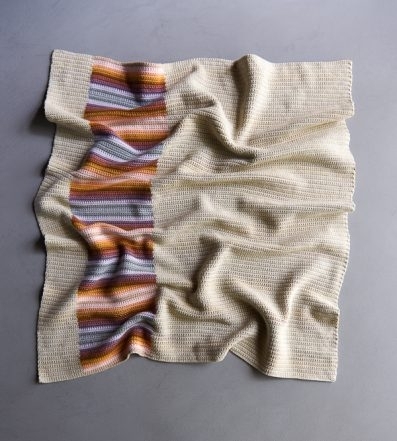 I LOVE this new blanket and would love to make it – but the price is a little steep for me at the moment – is there a similar colourway that I could access in slightly cheaper yarn? Thanks for writing! One way to easily reduce the total cost of the blanket (but still have a similar look & feel) would be to not include all of the colors we did in the striped portion, and choose 5 colors instead of 10. 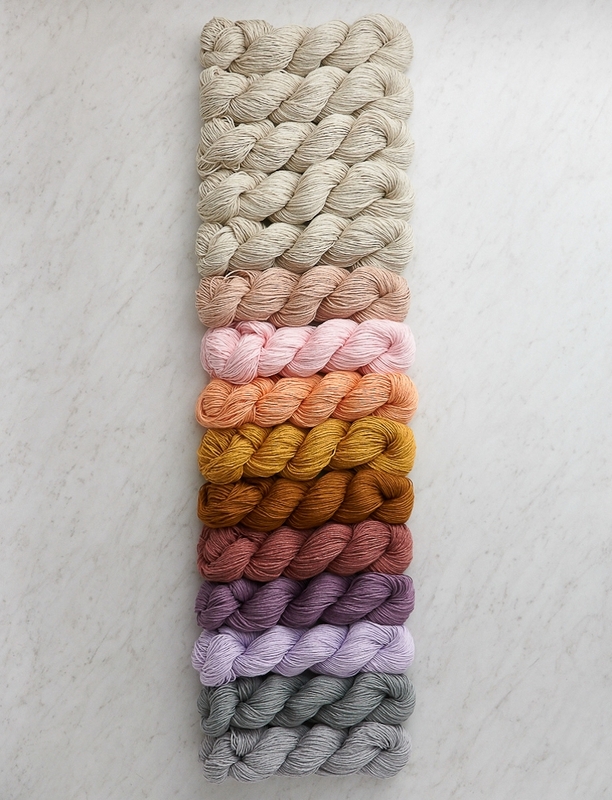 Two striking combinations (if you wanted to do this) would be: 5 skeins of Birch Bark, 1 skein in Sea Pink, 1 skein in Purple Heath, 1 skein in Pale Lilac, 1 skein in Bucket Gray, 1 skein in Cloud Gray OR 5 skeins of Birch Bark, 1 skein Teacake Pink, 1 skein in Icy Pink, 1 skein in Golden Peach, 1 skein in Yellow Curry, 1 skein in Warm Cider. In a search for similar colorways in other yarns, I had a tough time getting a sequence that I felt was close enough to recommend, but I’m sure that there may be other brands and types out there that come close! I wish you good luck and please let us know if you have any further questions! Great blanket. I’m wondering what yardage is used for each color so I can accurately substitute a different yarn. You’ll need approximately 1080 yards for the main yarn, 32 yards for color B, 27 yards for color K and 53 yards for colors C-J. Best of luck! 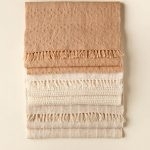 I have found using other cotton yarns that the blanket gets stiffer with repeated washing and drying. Do you have any suggestions for the temperature of water and heat of the dryer? Thanks for writing us. I suggest washing in cold water and drying on the cool setting. 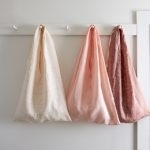 This might help but ultimately hand washing will be the best if you want to preserve the drape of the fabric.